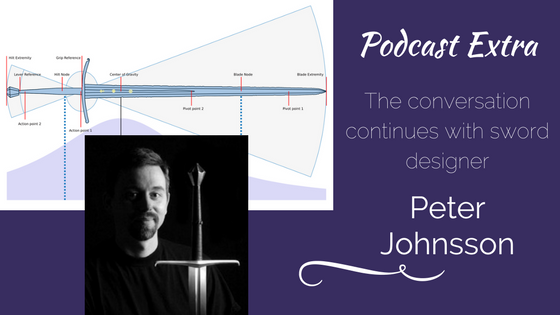 In the first part of my conversation with sword maker Peter Johnsson, we talked at length about the symbolism and cultural significance of the sword, and how it reflects both medieval and modern understandings of the ideals of chivalry. But after the show was over, we went on talking and we both realized that our discussion hadn’t really covered something that both of us found immensely interesting, which is: the proportions, specifications, and function of historical swords and their modern reproduction counterparts! So, we decided to continue our conversation, and make it available to all of my fellow sword nerds in something of a podcast extra. Now, if you’re not into the fine details of sword design, this part of the conversation may not be quite as interesting to you as the first part of my talk with Peter – although I daresay that Peter has some pretty interesting things to say about swords in history, even if you’re not into studying, collecting, and possibly even using them yourself. The topic that prompted the following discussion was the recent release of an online computational analysis tool called the Weapons Dynamics Calculator, developed by Vincent le Chevalier, an expert in both European martial arts and physics, in conjunction with Peter Johnsson. The program was created to present graphical analsys of the handling qualities of the swords that were on display in an exhibition called The Sword – Form and Thought, at the Deutchs Klingen Museum, in Solingen Germany. The illustrations that it produced are both beautiful and enlightening to anyone who has a interest in sword combat – and a catalog showing all of the swords and the dynamics illustraitons is available from the museum’s online book store. In this discussion, Peter talks about things like mass distribution, nodes of percussion, and points of rotation. 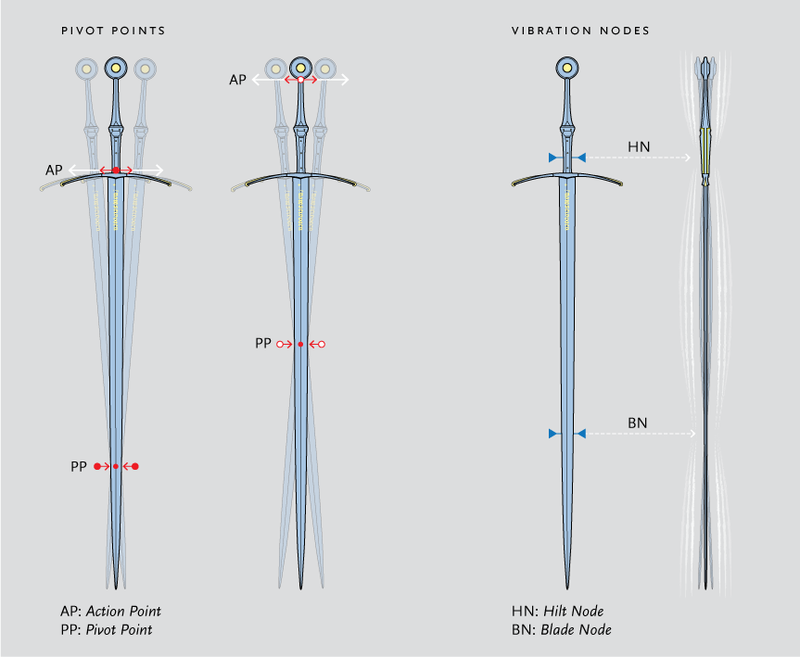 Here are some graphics from the WDC website that will help you understand what those qualities are, and how Peter derives the metrics and data about sword handling and performance that results in the illustrations created by this analytical tool. 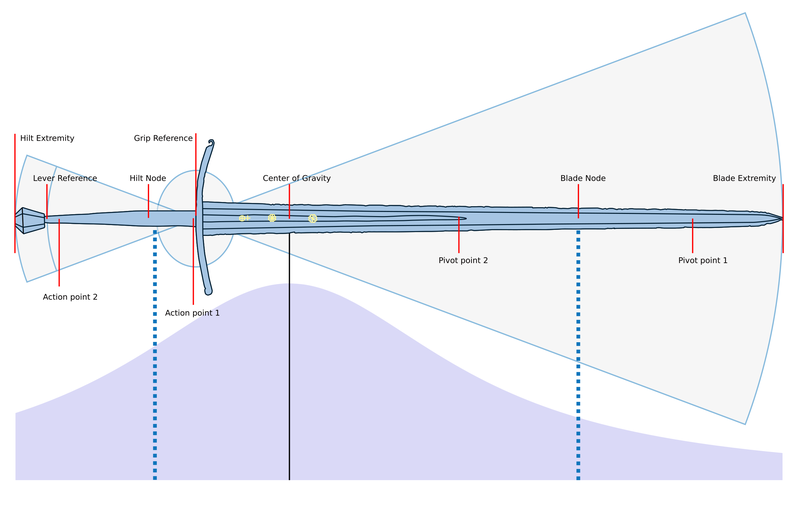 Distribution of mass (shown in graphic form at left) indicates the “nimbleness” of the blade, or the ease with which the blade rotates around the hilt. 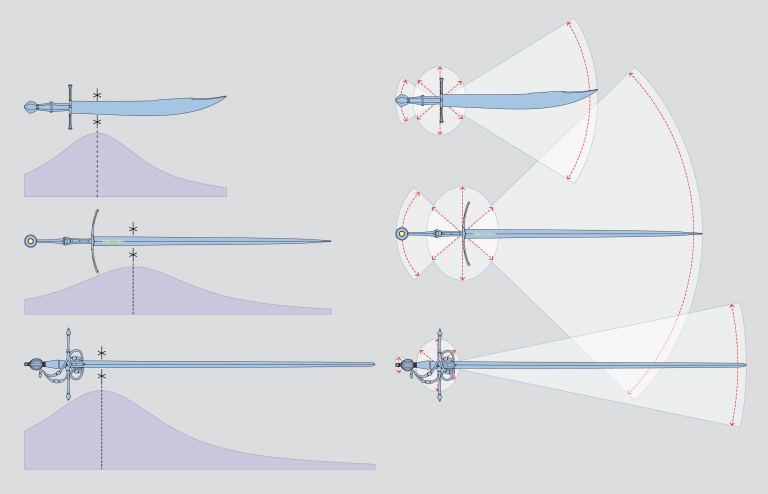 The oval and hourglass representations (at right) give a graphic display of the linear and rotational handling qualities of the sword. With all the elements in place, a graphic representation of the sword can be produced by the calculator. This is not an assessment of a sword as “good” or “bad,” but simple a visual representation of the particular handling qualities a sword will have when put into use. Visit the website of the online Weapon Dynamics Calculator, developed by Vincent le Chevalier, in conjunction with Peter Johnsson. Humility – Huh? – What’s It Good For?